With the rapid development of science and technology, humankind has begun to take the step of exploration into space. Recently, Space Elevator, a cutting-edge planet-to-space transportation system has been introduced. The concept of it is that a very long cable is fixed on the earth and then extended to space. This will allow vehicles, material even people to directly travel into space. However, the construction of space elevators is quite controversial. Whether it promotes human progress and aerospace development with a lower cost and energy, or the space elevator is just a waste of existing resources and an unreliable development creates a debate. The building of space elevator would be the milestone for the change of future space technology and perception of human to space. First of all, nowadays, training a qualified astronaut will be a costly investment, and only specially trained astronauts have the opportunity to board space. But this situation is totally contrary to the equality that is stated in Kantian Theory. Because the duty ethic states that we have to treat people equally, which means the respect and concern given to each person should be same. The biggest obstacle to achieve this equality is the cost of aerospace technology. As we know, the space rockets are very expensive, it costs almost 10,000 dollars to send a pound load into low-Earth orbit, and the price would be ten times higher if the aim is sending a person to another planet. However, with a space elevator, the cost will be cut to about 10 dollars, which is far cheaper to send people into space and without any risks of life. That is to say, space elevator provides more opportunities of space exploration to normal people, therefore, the construction of space elevators is in line with Kant’s principle, so this programme should be promoted. In addition, another important motivation for building space elevator is learning and sharing, which can be considered as a virtue. Therefore, exploration and sharing of knowledge obey the virtue ethics. Furthermore, the exploration of space can be upgraded to a new level by space elevator, because space elevators can significantly reduce the cost of space experiments and exploration. The space elevator is also a large-scale project which there will be many countries involved, and therefore knowledge will be better shared. Utilitarianism states if an action can create maximum happiness, that action will be considered as a right action. The space elevator can be a great platform for developing space mining, migrating, and industry which is sustainable. The space elevator will provide human with the resource and living space, which is the basic demands of human, definitely raising satisfaction of human for a long time. Other than that, another crucial benefit from building space elevator is creating job opportunities. At the earlier stage of the construction, the plenty of workloads and human resources are required to ensure that sufficient material are made for elevator. After the elevator is built, the maintenance and monitoring are also necessary so that it will provide a plenty of jobs to many people. Since people can get jobs to earn money, happiness will significantly increase. Therefore, according to the fact discussed above, building space elevator will increase happiness for human, it is a right action and obeys Utilitarianism. Although space elevators can solve the problem of material and energy shortages in the future, these problems are not very urgent at present, and the aerospace ladder is not the only solution. According to the 2018 study, if the global use of oil and natural gas is still maintained in 2017, oil and natural gas can still be used for more than 50 years, and other resources can be used for a longer period of time. At the same time, renewable energy will gradually replace non-renewable energy, which will give us enough time to develop new energy sources such as nuclear energy that can solve the energy shortage problem. Humans are now in the early stages of space exploration, and the resources needed to travel to and from Earth and space are insufficient. With the small demand for space elevators. Taking into account the high cost of construction costs, travel costs will be higher than using rockets. When a large amount of material needs to be transported into space, it means that people have made major breakthroughs in the space field, and space elevators may not be the best choice at that time. And there are about 3000 meteor showers passing through the earth each year. These meteorites will cause catastrophic damage to space elevators, which means considerable maintenance costs. At present, there are still 815 million people who are in hungry in the world, even in the UK, there are at least 30,7000 homeless people. People can adopt a method of situational ethics, which requires making ethical decisions in consideration of the circumstances of the case, not just prefabricated decisions and prescriptive rulers. In the current situation, we need to invest money to build a society to solve the problems we face, not space elevators. In addition, the space elevator is a big project, which means that the project will be developed worldwide. Considering the economic level and scientific research techniques of each country, not all countries in the world can afford it. Looking back at history, this situation is similar to the space race. The Duty Ethics emphasizes motivation. In this case, it is difficult to distinguish the initial motivation of the space elevator. The motivation is to solve the shortage of materials and energy and carry out space exploration. It can also be one of Egoisms. It should not be the second ‘space race’ until we do it, and we should stop it. In summary, space elevators can promote the development of space science and solve population and resource problems, but they are not urgently needed. Therefore, the space elevator should be continuously developed, waiting for the good opportunity to build. This article is very great!!! A good article provides us a new menthod to solve urgent problem in today’s world. This is good idea, but material science must have a great break though. this is a very interesting topic, very unique point about space elevator in terms of ethical consideration. In my opinion, I think the space elevator should be built because it can push space travel and space exploration into another whole new level in order to develop human living. I agree with you, and I also think that this is a very interesting and very new topic and method. I think the space elevator just the waste of resources and money, Because with the same money, we can develop facilities that are more beneficial to humans than space elevators, and technology and materials can not support people to build space elevators. The negative impact of building space elevators is better than a good impact. Interesting topic and makes me think a lot over ethical issues about space elevators. However, I personally believe that poverty and unemployment issues are impossible to completely being solved at least in decades. It could be alleviated but not quite possible to be 100% solved to some extents even though the government put a lot effort and wealth in it. But in this case, space elevator could really help a lot of people find jobs and solve the unemployment problems in the society, which could also create many occupations. But also arguably, those jobs are only available to those with advanced technology skills, which means the jobs are not equally open to every one. Very in-depth comments have their own ideas and convinced me that I agree with you. I agree with you, Hannah66666 gave a very deep insight into this article. A very interesting topic, I agree that humans should develop space elevators. This brings a lot of possibilities for future development. I think it’s not necessary to build the space elevator before we could find enough life support resource and figure out what we gonna do in the space. For example, maybe one day in the future, we will find that there’s a perfect planet for human beings to stay and live in stead of the earth. Then maybe space elevator needs to be built to develop human’s life quality otherwise it’s such a waste. In my opinion, the realization of space elevators will be a major step for human beings to explore the universe. It will not only promote the development of science and technology, but also benefit the exchange and communication of the economies of various countries, such as the mutually beneficial cooperation between the producing countries and the R&D countries. The article mentioned that space elevators can improve people’s quality of life. But I think this is just an idea and it may not be realized. As mentioned later, the development of space elevators at this stage does not require construction. What we need now is to solve the problems of humanity at this stage, such as hunger, poverty, environmental problems and energy problems. Therefore, I feel that the focus should not be on building such a large-scale project. While the project has the potential to advance technology and human exploration of space, it is worth considering the possibility of ownership.Because when it comes to this project, geography can be controversial.For example, in the repair, maintenance, and the existence of the potential danger, when this happens, who will be responsible for it.I think it should be thought of. I had no idea this could be used to develop the space/asteroid mining industry! I think there’s huge potential here. I like the conclusion in this article. As you’re dealing with a (near) future issue it seems the right decision: don’t give up on the dream, but keep it on the back burner for now. The argument for contained a lot of ethical reasoning – thumbs up from me – but the argument against needed a bit more ethical support. Virtue ethics is worth exploring. 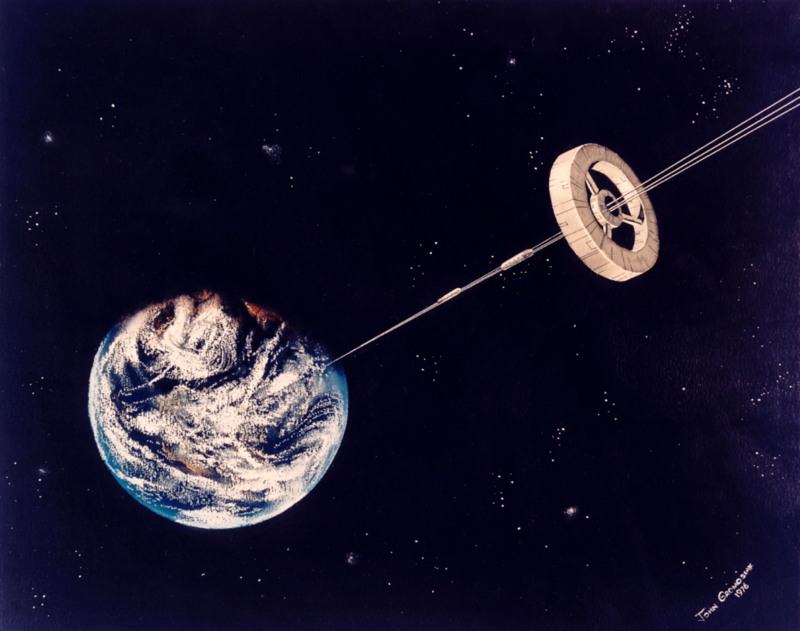 Ethics aside – where would we put a space elevator? At the equator? If so, could we boost the location’s economy?